Upright, very vigorous plant, suitable for both open field and protected cultivation. The dark green fruits, are 2 cm wide and 16cm long, and have a smooth glossy skin. Venom F1 is characterised by the highly uniform fruits, throughout the harvest season. 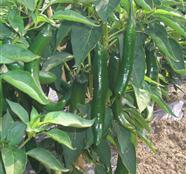 This hot pepper is suitable for fresh and dry market.